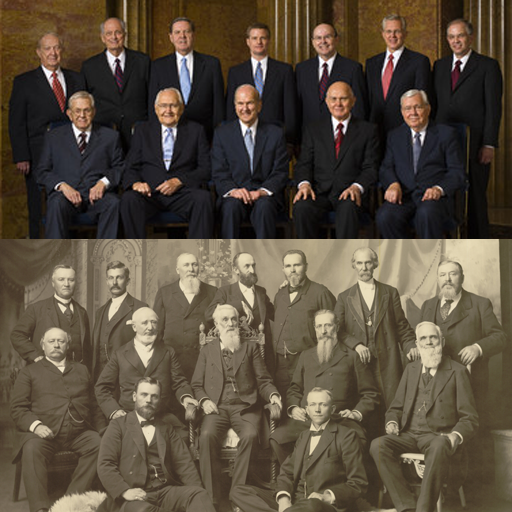 Which Mormon “prophet,” will they claim, didn’t have the “constant companionship” of the Holy Ghost? If they can’t tell us that, then they can’t say the “prophet” did not always speak by his power. This would include Young’s teachings on Adam-god, blood atonement, and the priesthood ban on blacks. The Conference Addresses of the Church (from the Journal of Discourses to the present) are full of such opinions. How can you know when these men are giving their opinions? Why, they tell you so. 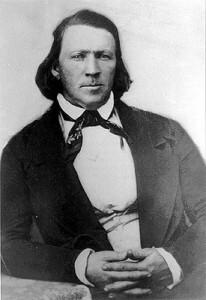 Since no Mormon audience that we know of ever spoke out against any of the sermons in the Journal of Discourses or subsequent Conference Reports, we can rest assured that these men were speaking by the “power of the Holy Ghost” and were indeed teaching doctrine and scripture unless (as they did frequently) they indicated that they were just giving their opinion. This entry was posted in Authority and Doctrine and tagged Authority, Brigham Young, Continuing revelation, D. Todd Christofferson, Mormon Doctrine, Moses Thatcher, Orson Hyde, Truth. Bookmark the permalink. Lurkers, One more thing, Shem Claims I lie and he is as Honest as God is. He claims he ignores Grindael, yet then says, Grindael misrepresents him. How would he know that if he ignores him? Just a thought. So, Rick, do you lie? Yes, in almost every sentence. Only an idiot would not be able to see it. I know this quote very well, but tell me where it once mentions practicing plural marriage. It doesn’t, and yet you are claiming it does. It talks about accepting the doctrine and not denying that it is doctrine. That is true, and that is what I have always maintained. What it doesn’t do, and what you have thus lied about, is state that if we don’t practice plural marriage we would be damned. The New and Everlasting Covenant is the Covenant of Exaltation by which men are brought into the presence of the Father, and if we reject this covenant once it has been revealed to us (meaning personal revelation and ordinance) we are then damned. An appendage to this covenant, or a small portion of it, is that of Plural Marriage, which God has told us is only practice when he specifically commands it, and is an abomination when he does not (Jacob 2: 27-30). Rick, this is just an example of how you lie and twist the truth. I used to think this was out of ignorance, but that is no longer a consideration. Of course he wouldn’t want to mention that I have, in the fairly recent past (a few months at most) engaged Grindael in several discussions on various topics and have experienced his dishonestly first hand. For this reason I have currently chosen to ignore him as best as I can. See, Rick wants you to think I am dishonest, and so he will take anything he can twist and manipulate to make it appear so. He even wants to exaggerate my claims of honesty. Who is the dishonest one here? Many of the problems which arise in debating issues with LDS members can be put down to this. All genuine Christians know that the message of the Gospel is very simple, Christ gave us the ‘fullness’ of the gospel in one verse (John 3:16) but the problem with Mormonism is the turning of that simplicity into something so complicated it can be correctly interpreted & understood only by those with special gifts such as LDS apologists. Rick, like most of us here, read what the LDS leaders say & interprets their words in the most obvious way. You however, in order to defend the LDS corporation, interpret their words in such a convoluted way that only you can understand what they say. This leads to a couple of problems, not only for Christians but also for the ‘less gifted’ members of your organization. It seems that we & they have to turn to apologists to decipher what LDS prophets say in order to understand what they actually mean, we also have to decide who among them is actually speaking for God at any given time. Because of this problem I could ask questions of a dozen different Mormons & get several different answers but at least the majority would be honest & say that they don’t have an answer. Therefore I see in Rick’s interpretation of the Journal of Discourses nothing to indicate that he is lying, he is simply following the principle of ‘occams razor’ i.e. the simplest explanation is usually the correct one. I’m sure you have engaged Grindael in several discussions but you’re also very quick to accuse those who disagree with you of dishonesty. From all that I’ve read on this site over the last several years you have accused almost every non Mormon who debates with you of lying. As for ignoring people all I can say is that you are doing what appears to be common practice among LDS Mormons, ‘if you can’t answer your critics, ignore them’ Why is that, could it be that if difficult questions can’t be answered in any sensible way a Mormon apologist finds it easier to ignore the questioner than to honestly admit that he has no answer? 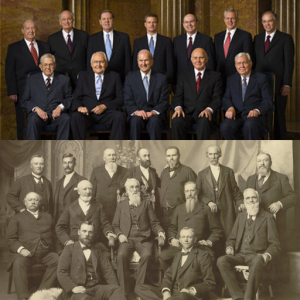 YOU MIGHT AS WELL DENY “MORMONISM,” AND TURN AWAY FROM IT, AS TO OPPOSE THE PLURALITY OF WIVES. So If I deny it, I’m in the wrong, so if I agree with it then that means one of two things, I either also practice it, or if I dont practice it, then I am at least ok with those who do and I except it. It is no different than the whole Homosexual agenda now being pushed in the U.S, And here in MN where I live. If I disagree with their life style and claim it is wrong, I can lose my Job or go to jail, and be called a bigot and face hate crime charges, otherwise I must except it and say, I’m ok with it even if I dont practice that life style. It is clearly saying, If they dont agree with this doctrine they will be damned. It does not say, If they deny the doctrine, they wont be damned. An appendage to this covenant, or a small portion of it, is that of Plural Marriage, which God has told us is only practice when he specifically commands it, and is an abomination when he does not (Jacob 2: 27-30). Funny how God must threaten JS to practice plural Marriage. Then Jo must lie about it and keep it a secret from his wife, and then when she finds out she does not agree with it. Your god is so cruel he does not care about all the women that were hurt, so please, dont even try telling me I am wrong, your the one thats refuses to pull his head out from a dirty dark hole. You cannot honestly tell me, you really believe God told JS take many wives or die. And then he needed to keep it a secret from his wife. Then send people on “Missions” and then take their wives. What a joke. The problem is that Rick and others don’t use the simplest explanation, or they take a single quote and ignore everything else said so that they can claim they are using the simplest explanation. This is what Rick did in quoting from D&C 132. He ignored the seventh verse which explained the nature of the New and Everlasting Covenant, so that he could claim the verses he quoted spoke only to the doctrine of Plural Marriage. However, when the verses are read in the context of the entire section the simplest explanation is the one that I gave, not the one that Rick gives. This is usually the case. As to simplicity in the gospel, verse seven of D&C 132 does a great job of summing it up, and it couldn’t be simpler. Everything we do must be in the name and by the power of God or it has no effect after this life. If we perform an act or ordinance at it does not receive the sealing power of God it is worthless. Is there anything simpler? Now, we have had revealed to us many truths that expand on this simplicity, and it is these things that people like Rick want to focus on to give the impression that the gospel isn’t simple, when it really is. But these things are only secondary, despite peoples desires to make them otherwise. Some are even tertiary, or even less important. Now, I have called out many people in their lying. I have also commended people for their civility and honesty. I do not accuse without evidence, and have pointed out that evidence when I do accuse. I also do not commend with evidence. Lasting, if you have been reading here for years you should know that “if you can’t answer your critics, ignore them” is not my style. I have answered every question put to me directly, and many that were put to others. I do not ignore questions, nor do I wish to. I ignore Grindael, not because I can’t answer him, but because he is rude and arrogant; he lies, not only about what the prophets have said, but about what I have said; his tactics are that of a bully; in generally, engaging with him is mentally and emotionally sickening and I have no desire to contaminate myself. This is not a high opinion, and I may get in trouble for saying it, but this is my reason. I can, and have, answered him many times in the past, and he has ignored what I said, lied about what I said, and generally plaid the bully in every thread he is in. You once again show your lack of understanding of the doctrine of plural marriage. This is not accurate. I accept the doctrine and principle, which means I accept the laws and regulations that govern it. I do not practice it, and I am only okay with those who practice it according to these laws and regulation. If one practices plural marriage in a way that is not in accordance with these laws and regulations then they have turned from the doctrine. There is no leader of this church that has turned from the doctrine because they all practice this according to the laws and regulations set forth. Those laws state that at this time no man is to have more than one wife, and thus they are complying with the principles of the doctrine. This is exactly what the quote you give says is required of them, and so once again you must misrepresent or lie concerning the words of prophets in order to make the claims you do. I can honestly tell you that I have heard accounts of an angel telling Joseph Smith that if he did not teach the practice he would be destroyed. Whether this is true or not doesn’t really matter to me, though I am inclined to think it is. I can honestly say that Joseph Smith did not do anything in regards to this doctrine and principle that he was not justified in doing because of circumstances. I can also state that there is no real evidence (and hearsay is not real evidence) that Joseph Smith ever had relations with another man’s wife. There were those who used this principle to seduce women and justify their own lusts, but they were condemned by Joseph Smith and excommunicated. Now, whether or not you can accept this means very little, and your accusations and opinions do not establish or prove doctrine. So, what you are saying is that those of us who grew up in the religion, who have studied the doctrine, learned the principles, and practiced the faith for 20 or more years don’t actually know what it is we believe and practice, but need to go to those who have never been part of the faith to learn what it is we are actually doing. Perfectly said, and I couldn’t agree more. Practicing it was never required, but accepting the practice has always been required. When have I ever said anything else? But not practicing the doctrine does not equal denying it. Please clarify your meaning in this sentence. You have no understanding of God if you can actually claim this. God cares deeply about all the suffering of all his children, and I might say more especially to the suffering of his daughters. But he has his laws, and he cannot go against his word. People suffer for many reasons, and one of those reasons is because they reject the laws of God. God is saddened by this and hates to see his children suffer for it, but it is their choice, and they must abide by it. As to all the woman hurt by it, that is actually comparitively few if you had any real understanding of the practice. It was actually the woman who spoke out in favor of the practice when it was made illegal. It was the woman who embraced the doctrine more quickly and more deeply than the men. The practice itself caused no greater harm to woman than monogomy has through the years. I can honestly say that I have heard accounts that Joseph Smith was told to teach this doctrine or be removed from his position. whether they are true or not does not really concern me, so I do not deny them, nor do I actively speak of them. I can honestly say that whatever Joseph Smith did he was justified in doing because it was obeying the commands of God. Yes, he kept some of his marriages hidden from Emma, and was justified in this because she had rejected the doctrine and had turned against Joseph in this matter. He never once took another man’s wife, and despite all the accusations to the contrary there has never been any credible evidence to say otherwise. You speak of things you know nothing about Shem. Please read this by D. Michael Quinn. He presents all the evidence that anyone could ever want. You are simply wrong here. Demonstrably wrong. Only the cult mentality places men on such a pedestal that one would say that they are justified in doing ANYTHING.